There are moments that remain fresh in memory as fresh as you experienced them. And if those relate to your childhood, it’s more precious than one thinks. One such memory that remains fresh for me would be the first time I heard or rather remember Amma talk about her childhood friend. She was a year older to Amma and they used to go the same school. Amma has a framed photo of herself taken along with her two friends. The first time I ever noticed that picture was when I was maybe about 12 years or so. I don’t exactly remember but the memory is quite distinct. Amma used to store her memorabilia in one metal suitcase. A chance lead me to dig into that and I discovered quite a few treasures. One of them was this precious picture of the friends. I could see a smile breaking on Amma’s face when she fondly remembers her friends and how they used to go to school and the other times they spent together. She really wished she knew what happened to them and where they were living currently. I think one of the ardent wish of hers was to meet her friend and her Uncle, who was the school Principal. She used to praise him so much, as a model teacher, a role model for students to emulate and principles to follow. I always used to tell her that we should try to trace them and then we used to wonder how. We finally were able to trace their whereabouts and Amma finally spoke to her friend. That was one moment I can never forget. The joy I could sense in Amma’s voice when she said spoke to her friend, was infectious and very content. It was almost like little girls getting back to their mischievous deeds. Her friend visited us last year and it was such a lovely moment seeing how they conversed and enjoyed reminiscing their childhood days. Couple of months back, we had the pleasure of having them visit us. Both Aunty and her husband stayed for a day. I was so excited to be among them. It was so sweet hearing them both call each other by names. I hardly hear my Amma being called by her name, so it was musical to hears. And the wonderment I saw on their faces, talking to each other and having grandchildren around was pretty amazing. The whole day Amma planned the menu as per their liking, but for dinner Aunty wanted to make something when she saw bottlegroud. She said she makes a bottlegourd kura and a pachadi with the peel. This was the recipe she shared with us. Wash and peel the skin from the bottle gourd. The cube the sorakaya into small pieces. Then heat a pan with oil, add methi, coriander seeds, hing, cumin seeds, bengal gram, Then add the red chilies, green chilies, remove that aside. Then add the peels, saute well. Then add the sorakaya pieces and saute for a while. Remove and allow it cool. Once it is cooled down, grid to a almost coarse paste. Heat another pan with oil. 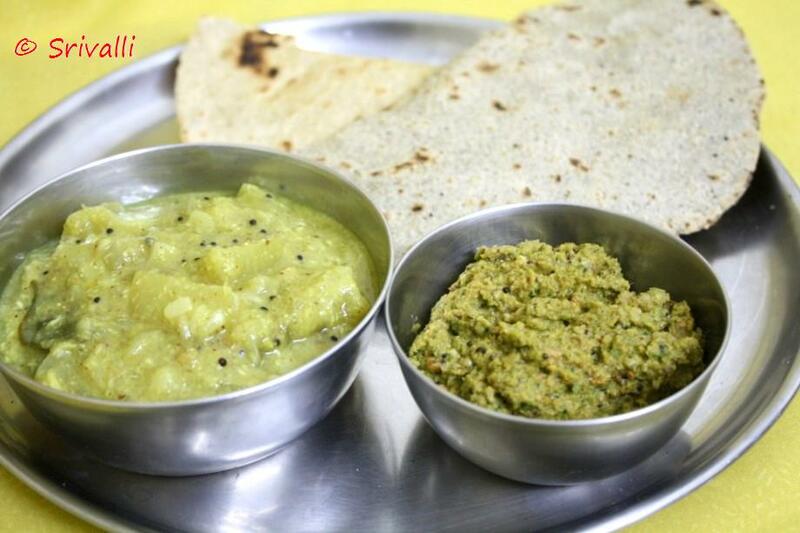 Once it is hot, add mustard seeds and urad dal. When it splutters, pour over the ground chutney and mix well. 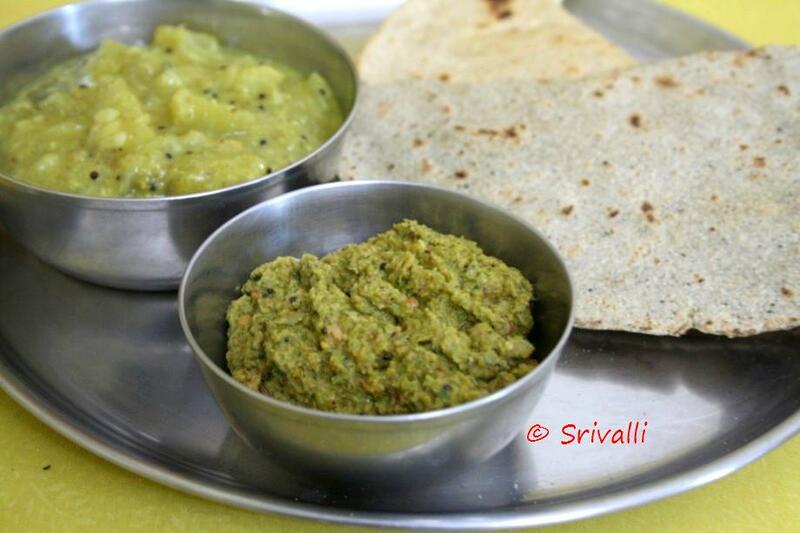 this is a nice recipe with sorakkai…colour of the thokku is nice…. I can imagine how excited your amma was when she spoke to and met her friend. Couple of years ago, I ran into my schoolmate and the feeling was amazing! I had not seen him after my middle school and he was my junior. He walked up to me and asked if I were Usha. We met after 20 some years and I was totally surprised that even I remembered his name right away, even before he introduced himself. He was not my close buddy or anything, yet we recognized each other.. our fathers were friends though. What a sweet story, Valli. Both the dishes with Sorakaya look delicious. Good one..my mom makes pachadi with almost every vegetable peel ..sometimes unimaginable ones!! delicious and nice pachadi !! I guess adding the veggie in addition to peels, gives extra body and flavor to the chutney. I never made it with sorakaya thokku…tho I have heard about it! this is very nice pachadi! I make a similar chutney with Peerkangai skin. Curry AND Coriander leaves! Yum!